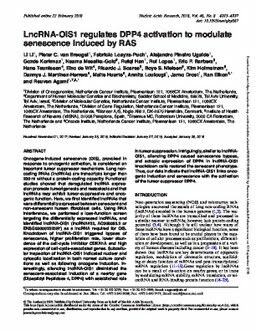 Oncogene-induced senescence (OIS), provoked in response to oncogenic activation, is considered an important tumor suppressor mechanism. Long noncoding RNAs (lncRNAs) are transcripts longer than 200 nt without a protein-coding capacity. Functional studies showed that deregulated lncRNA expression promote tumorigenesis and metastasis and that lncRNAs may exhibit tumor-suppressive and oncogenic function. Here, we first identified lncRNAs that were differentially expressed between senescent and non-senescent human fibroblast cells. Using RNA interference, we performed a loss-function screen targeting the differentially expressed lncRNAs, and identified lncRNA-OIS1 (lncRNA#32, AC008063.3 or ENSG00000233397) as a lncRNA required for OIS. Knockdown of lncRNA-OIS1 triggered bypass of senescence, higher proliferation rate, lower abundance of the cell-cycle inhibitor CDKN1A and high expression of cell-cycle-associated genes. Subcellular inspection of lncRNA-OIS1 indicated nuclear and cytosolic localization in both normal culture conditions as well as following oncogene induction. Interestingly, silencing lncRNA-OIS1 diminished the senescent-associated induction of a nearby gene (Dipeptidyl Peptidase 4, DPP4) with established role.